June 5 2016. In the end Sunday the 5th was a near perfect day for running. We had been warned that the day might be a bit hotter than normal by San Diego standards. The Rock n Roll 5K was run on Saturday and some people had heat problems. But, as it turned out, the early cloud cover did not burn off until later in the morning. The 6:15 AM time was not popular when people were rolling out of bed at 4 in the morning but it was definitely a good thing in that all of the Masters Championship runners were finished well before the temperature climbed to 70. And there were a number of remarkable performances. Men. Kevin Castille had to compete with Meb Keflezighi last year but this year Meb was pacing so Castille was the strong favorite. The only question was whether Castille had fully recovered from his plantar issues that cropped up again at the Olympic Trials Marathon. He ran the first 13 .1 miles of the Trials Marathon at a fine pace, in the main chase pack behind the lead pack. But he called it quits at that point because of worries about a plantar fascitis issue he has battled off and on for the last year. John Gardiner who finished 4th last year in 1:10:04 (chip) figured to be his main competition. I listed Okwaro Raura, Brantley Lutz, and Christian ‘Cush’ Cushing-Murray as potential medalists. Castille quickly established himself as the one to beat. He crossed the first 5K in 15:54, nearly a minute ahead of a chase pack consisting of Gardiner, Cushing-Murray and Raura, with Lutz laying off that pace by a half minute. By the 10K mark, Castille had stretched his lead to a minute and a half and Gardiner had a 5 second gap on Raura and Cushing-Murray, with Lutz 46 seconds further back. The next 4 miles saw Castille stretching his lead on Gardiner as Gardiner, in turn, stretched his lead on Cushing-Murray, with Raura dropping out fo the top 3 and Lutz now only 31 seconds behind Raura. Castille strode to a fine win in 1:07: 27. Gardiner bettered his 2015 time by 7 seconds, cracking 1:10. Cushing-Murray had surprised some last year by cracking 1:14 and taking 8th place in this race. Known primarily for his short distance speed from the 1 mile to the 5K, he showed that he had staying power. This year he cranked it up a notch, beating his 2015 time by nearly 3 minutes! Castille took the gold medal and teammates, Gardiner and Cushing-Murry took Silver and Bronze respectively. Raura finished in 4th with a 71:48 time, holding on to best Lutz by ten seconds. Lutz also bested his 2015 time, in his case by over a minute. Women. The favorites appeared to be Rachel Jaten, Julie Swanson, Hilary Corno, and Cate Fenster, and possibly Mariam Ngo. 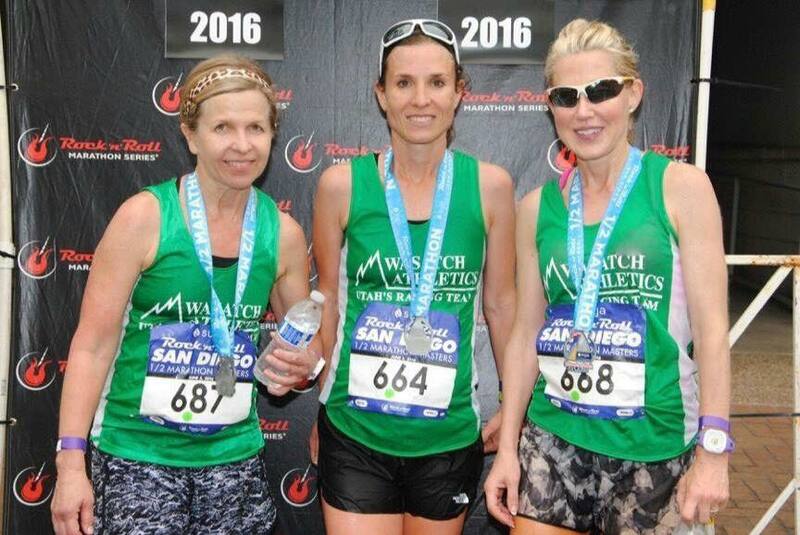 Jaten ran 3 sub 1:20 half marathons last year with the fastest being her 1:16:46 in the RnR San Jose Half Marathon; she also ran a 2:46:28 Olympic Trials Marathon. She recently placed 21st overall and 3rd Masters in the Lilac Bloomsday 12K race with a 44:13. Swanson ran a 2:58:22 at the BMO Harris Phoenix Marathon in March and is credited with a 1:19:59 Half Marathon time [or equivalent] on the USATF entry sheet. Corno took first among women 40-44 at the Boston Marathon this year and ran 1:17:48 at the RnR San Diego Half Marathon last year before becoming a Masters Runner. 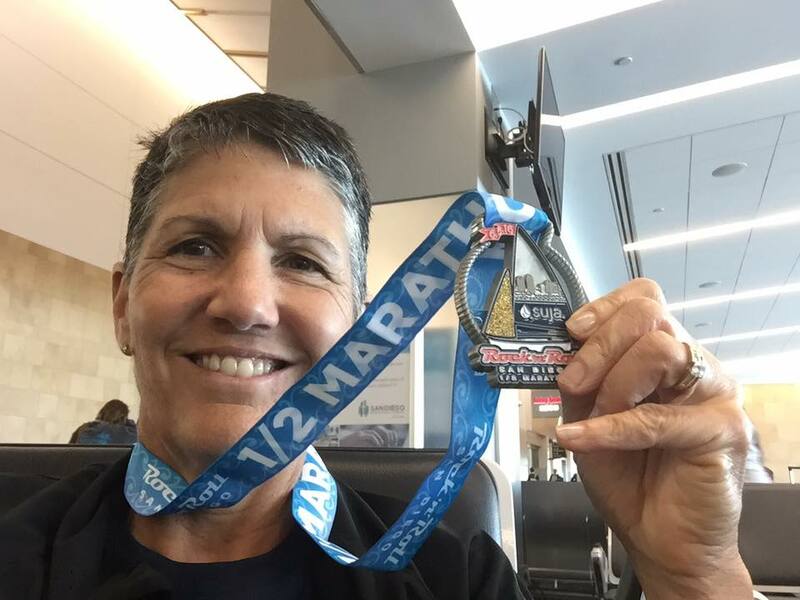 Most of Fenster’s Half Marathons last year and early this year are in the 1:24 to 1:26 range but she does have a 1:20:58 at the Runner’s Den Fiesta Bowl Half Marathon. Ngo is listed by USATF with a 1:22:22 effort. Jaten, Corno and Ngo all set off at a good pace but by the 5K mark, Jaten had clearly established herself as the one to beat, crossing the timing pad in 18:22. Corno was 43 seconds behind Jaten but Ngo only 5 seconds off Corno’s pace. Fenster was 16 seconds back, with Ingrid Walters 26 seconds back in 5th; Swanson was in 6th. From that place forward, the first 4 runners all increased the gap to the next runner. Jaten took the Gold by almost 4 minutes; Coro got the silver with a minute and change to spare. Ngo, in a bit of an upset, took the Bronze medal by a good 2 and a half minutes, with Fenster just off the podium in 4th. Swanson ran a nicely paced, negative splits race, but could not catch Walters who claimed the 5th spot. Women. I listed the favorites as Honor Fetherston, Edie Stevenson, Deborah Torneden, Suzanne Morris and Joanna Rowland. Torneden and Morris did not run the race but the others did not disappoint. Stevenson, 66, took her third straight age-grading crown with a 1:38:59 and 92.6%. Rowland, 68, showed she is back on top of her game after a somewhat disappointing effort (by her standards) at Dedham. Here she clocked 1:43:45 for a 91.1% age grading score, besting the ‘World Class’ standard. Jaten, 40, the Overall winner, upset my predictions by taking the 3rd Age Grading spot with an 88.7%. Fetherston, 61 is still not fully recovered but even when not at 100% fitness, she still ran a 1:37:49 for 87.3%, the 4th best among the women. Men. Castille, 44, the Overall winner, also had the best age-grading score, a World Class 91.8%. Cushing-Murray, 48, was the big surprise in the Age-Grading race and the only other Masters runner to achieve the World Class standard, racing to a 90.1%. Third best on the Men’s side was the Marathon specialist, Fred Zalokar, 56, dropping down to the Half for a little speed work before taking on the Tokyo Marathon next year claimed the third sage-grading spot. 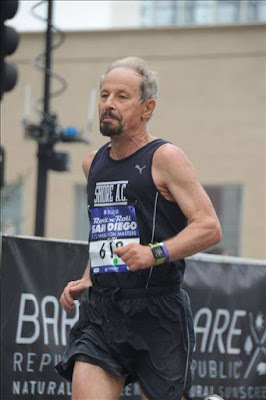 His 1:16:28 age graded at 89.9% [Zalokar has an Age Group win in 5 of the 6 World Marathon Majors; Tokyo is the only one left to achieve.] Kevin Broady, 54, ran a 1:15:46 for an 89.1% score and the 4th position among the men. M40. Castille, Gardiner, Raura and Lutz are all from this age group so the comments on the overall race hold for this group except that Cushing-Murray, who finished 3rd overall is in the next Age Group. Castille1:07:27 Gardiner 1:09:57 Raura 1:11:48. W40. The same comments apply here, only more forcefully as all of the top women in the overall race came from this group. M45. I had the Cal Coast group of Christian Cushing-Murray, Tony Torres and Jerome Vermeulen as the likely top 3, with Colorado’s Steven Fenster having a chance at the top 3. In the event, Cal Coast decided that they did not need Vermeulen to run in order to take the M40+ team title. So Vermeulen was free to pursue a Road Mile he had been targeting. But Gray Mahvera was a more than adequate replacement, cruising in to take the Bronze medal behind Cushing-Murray and Torres. Mahvera just nipped Matt Sheremeta by 1 second at the wire and Mahvera had a 20 second gap on Sheremeta at the 5K and it grew to nearly 30 seconds at the 10K. Sheremeta chipped away at the lead over the last 7 miles but ran out of race course before he could catch Mahvera. Michael John Stanley took 5th and Fenster was 6th. W45. Jessica Stanford was literally in a class by herself. And that was a shame; last year she ran 1:32:34 last year in this race, finishing 7th. She was ready for the competition this year and ran 6 minutes faster, a worthy time for a Gold medal. M50. Kevin Zimmer finished 4th last year in 1:17:16. 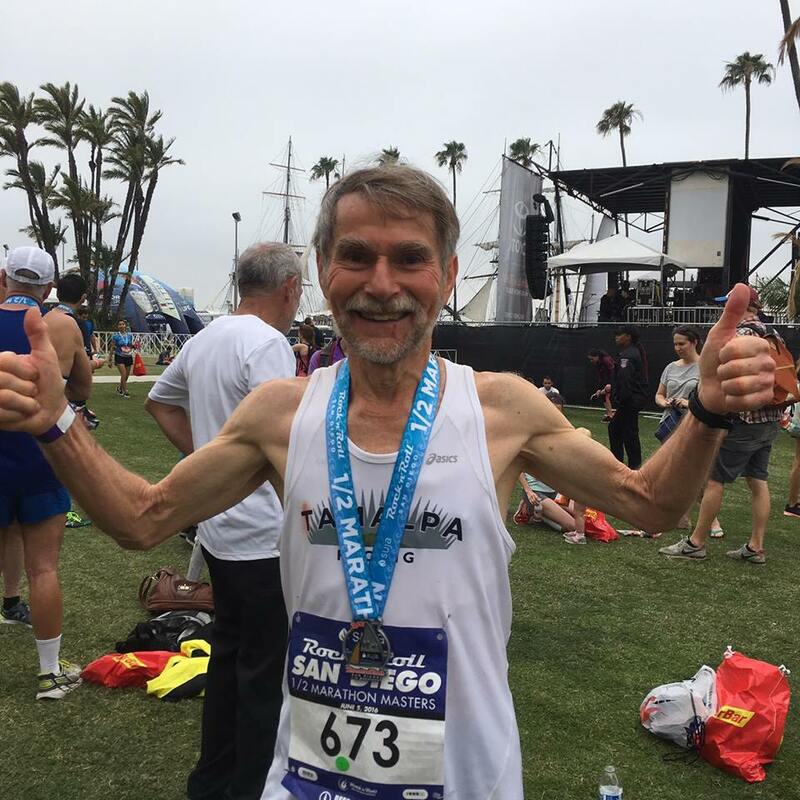 Kevin Broady’s 1:16:32 at the Surf City Half suggested he could mount a stiff challenge. Broady went out hard, establishing an 18 second gap over Zimmer and other challengers, a gap that he would grow over the remaining portions of the race to take the Gold Medal in 1:15:46. Zimmer had his hands full trying to establish and hold a gap on the two chasing Cal Coast teammates, Rob Arsenault and Gustav Quinonez. Zimmer’s 18:21 first 5K gave him a 12 second edge over the Cal Coast guys. But by the 10K mark, Arsenault had closed to within 7 seconds, with Quinonez right on his shoulder. They pulled alongside shortly after; at the 10 mile mark, Arsenault had an edge at 58:55, with Zimmer and Quinonez running stride for stride three seconds back. As they approached the final stage of the race, Zimmer made a move that the Cal Coast pair could not match. By the time they reached the finish line, Zimmer had 17 seconds on Arsenault, with Quinonez another 13 seconds back. Arsenault had the added satisfaction of knowing he had run three minutes faster than last year. W50. Based on 1:28:40 listed for her on the USATF entry sheet, it looked like Kirsten Leetch should be the favorite. After Leetch it looked like a tough battle between defending Champion, Kathleen Cushing-Murray and Michelle Simonaitis, who outran her by nearly a minute on this course last year. 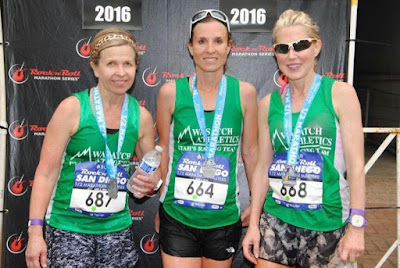 Mary Lynch’s Half Marathon events, finishing just under and just over 1:30 suggested she could also be in the hunt for a medal. I had thought Kelle Taylor might not have the staying power for a Half Marathon. In the last couple of years she had some fast times over distances from 5K to 10K and a single Half Marathon in a little over 1:31. But when the gun went off it was Taylor who looked for the lead and by the 5K mark she had a ten second gap on Cushing-Murray who had 18 seconds on Leetch. Lynch was 9 seconds behind Leetch with Simonaitis trailing her by a half minute. Btween the 5K and 10K marks that order got scrambled as Cushing-Murray and Lynch were running negative splits. Cushing-Murray took the lead, with Taylor over half a minute back and Lynch trailing her by 24 seconds. Leetch was 22 seconds back from Lynch but still with a 45 second lead on Simonaitis. By the 10 mile mark Cushing-Murray had upped her lead to a minute over Taylor while Lynch was now only 8 seconds behind Taylor. Leetch was a minute and a half back from Lynch with Simonaitis closing to within 24 seconds. Simonaitis was really rolling now and actually had the fastest closing 3.1 miles of this group, covering it in 20:26. She was able to nip Leetch for 4th place but had started her acceleration too late to catch the first three. Next to Simonaitis, Lynch had the fastest last 5K, passing Taylor and finishing within 27 seconds of Cushing-Murray who claimed the Gold Medal and improved on her 2015 time by 3 and a half minutes. Lynch took the Silver Medal and Taylor the Bronze in a hard fought race. M55. Last year this was the toughest age group but this year Fred Zalokar won it handily. William ‘Hugh’ Enicks made sure that Zalokar did not take it easy. After staying pretty close in the early going, Enicks fell 20 seconds back by the 5K mark and was never able to recover as Zalokar built on his lead and took the Gold by almost 4 minutes. Enicks took the Silver Medal with Gregory Cauller in 3rd place. W55. Mary Sweeney was the favorite based on a 1:31:36 Half Marathon last fall even though her half marathon time this January was 1:34:15 this January. Still, her 41:47 at the recent 10K Masters Championship in Dedham suggest she is race fit and ready to go. It appeared that Janet Smith, who ran a 1:39:48 at a Half Marathon this past November, would be the one to press her most closely. Whether due to injury or some other reason, it was clear from the start that Sweeney did not have the same fitness she exhibited last year, or even in Dedham. Sweeney ran the first 5K in 23:38, leaving an opening for Smith who only trailed by 39 seconds. Even though Sweeney was not up to her usual standard she was able to pull away over the next 5K, opening the lead up to nearly two minutes. In the meantime, Smith had built her lead over Teresa Quan from 59 seconds to 1:22. Sweeney gradually extended her lead over Smith, taking the Gold Medal. But Quan did close on Smith over the remainder of the race, finishing only 34 seconds back in third. M60. 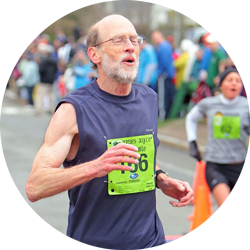 North Carolina’s Pete Gibson was a strong favorite; he ran a 1:21:03 Half Marathon last October when he was 59. In January he gave a further signal of what to expect by running a 1:01:32 10 miler and a 58:09 15K. Perry Forrester topped a Cal Coast bunch based on the 1:27:34 Half Marathon he ran just a month ago. John Holcomb is a very strong Cross Country and short distance specialist but I viewed the Half Marathon as a bit outside his comfort zone. 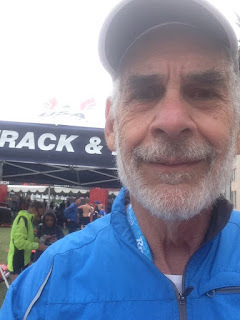 Keith Witthauer ran the RnR Full Marathon last year in 3:10:50 and Boston this spring (on a hot day) in 3:37:15 but seemed unlikely to get much below 1:30. Bruce Kirschner from Colorado will be hunting for a good result too. He enjoys longer races as evidenced by his 1:10 in a 10-miler this Spring and a 1:03:44 on a tough 15K course in Tulsa last October. Gibson showed early on that he was the one to beat, hitting the 5K mark in 18:59! The Cal Coast team of Forrester, Holcomb and Witthauer was running as a pack at that point with Forrester showing the way in 20:28 and Holcomb and Witthauer 2 seconds back. Gibson built his lead steadily through the race to take the Gold Medal by nearly 5 minutes. By the 10K mark there was almost a half minute gap from Forrester back to his teammates who were running shoulder to shoulder. Kirschner, who had started with a very conservative pace, was running negative splits but was still 1:20 back from them. By the 10 mile mark Witthauer could no longer keep up with Holcomb, and fell a minute and a half back, now only ten seconds ahead of Kirschner. Kirschner had a full head of steam, passed Witthauer shortly thereafter and claimed 4th place, 1:38 ahead of Witthauer. Holcomb proved that he could handle the Half Marathon distance, claiming the Bronze Medal 1:24 ahead of Kirschner. W60. Defending Champion, Honor Fetherston, was the strong favorite even though she has been battling some injuries over the last few months. She took the Gold Medal last year in 1:32:03. Laurel Collins and Sue Macdonald should contend for 2nd and 3rd well back from Fetherston. Collins ran the Marina Bay Half Marathon in 1:51:15 a year ago and Macdonald ran the Humboldt Redwoods Half Marathon in 1:51:47. Both have a couple of other sub-2 hour half marathons in the last year or so. The race went according to form with Fetherston well ahead of the other two from the very start. Collins and MacDonald had a close race for second although they were probably not aware just how close it was. They may have started in different corrals; Collins started 1:28 ahead of MacDonald and built that lead up over the first 10 miles. But in the last 5K, MacDonald closed the chip time gap from 1:18 to only 25 seconds. M65. With Lloyd Hansen sidelined by sciatica, Peter Mullin who just moved up from the 60-64 division this year, became the strong favorite. Hank Sullivan, who finished 2nd last year in 1:34:27, was the favorite for the Silver Medal again. Mullin is only two years removed from a late winter/early spring when he ran 3 half marathons in under 1:25, two of them under 1:22. Mullin showed he has largely returned to form, although he did not need to break 1:25 to capture the Gold Medal. Sullivan took the Silver 11 minutes back. W65. Edie Stevenson was the favorite to take her 3rd Gold Medal in a row, following her victories in the 8K at Brea and the 10K at Dedham. Defending Champion, Jo Anne Rowland, was the favorite for the Silver Medal took the Gold Medal in 1:46 while her teammate, Janet Cain, was expected to take the Bronze Medal. In the event it was almost as if these three were in separate races. Stevenson and Rowland were already 1:22 apart when they crossed the starting line and Cain was definitely in a different corral as she started 5 minutes after Rowland. Stevenson’s 5K chip time was 90 seconds faster than Rowland’s and Rowland’s was 3 minutes faster than Cain’s. By the finish, Stevenson had the Gold Medal with nearly a 5 minute gap back to Silver medalist Rowland. Cain took the Bronze. M70. Przemek Nowicki who captured the Gold Medal at the 15K and 12K Championships last year was the favorite for first. But it appeared Richard Kutzner could well push Nowicki; he ran the LA Marathon in 3:49:13. That suggests a 1:45 would not be out of reach and he might run faster on this course. If either of those two have an off day, David Cohen typically runs his Half Marathons in the low 1:50’s, and that should be fast enough to capture third place. It appears that Kutzner and the 3 Shore AC teammates, Nowicki, Edward Smith, and J.L. Seymore started in the same corral and all crossed the starting line at the same time. But they must have been on opposite sides of the road; in any case, Nowicki was not aware of Kutzner’s presence in the race. Cohen was apparently in the next corral back as he started almost 3 minutes after this first group. Kutzner had an 11 second margin over Nowitzki at the 5K mark and grew that to 46 seconds by the 10 mile mark. Nowicki cut that to 42 seconds by the end of the race but never was in sight of Kutzner. So Kutzner got the Gold and Nowicki the Silver Medal. From a glance at the split times it would seem that Cohen, Smith and Seymore had a real battle for third. But in fact Smith and Seymore never saw Cohen because he was placed into the corral behind them. Cohen ran the first 5K a half minute faster than Smith, who was 15 seconds behind Seymore at that point. But Smith surged from that point forward, running the first 10K 17 seconds faster than Cohen. But Cohen reversed that margin over the next 4 miles and then grew his chip time margin to almost two minutes by the time he crossed the finish line and claimed the Bronze Medal. Seymore finished 10 seconds behind Smith. W70. Defending Champion, Norma Thomas, was a late entrant. She was the favorite once she entered and did not disappoint. Although not able to match her 2015 effort, Thomas was fast enough to easily defend her title, winning by over ten minutes. Irene Terronez took the Silver Medal. M75. Hans Schmid was favored to take the title; he ran 1:48:32 in a Half Marathon in early 2015. Phillip Kroll ran a Half Marathon in Toronto a month ago in 2:03:15, a little faster than he ran the Dexter-Ann Arbor Half Marathon last June. Schmid had entered primarily for the team competition but was disappointed in that one of his teammates was not able to compete after all so they did not have a complete team. At least he won the race. Schmid ran a fine race, winning by over 15 minutes. Kroll ran almost as fast as he had in Toronto and had the added pleasure of competing on a complete team. M80. There were two contenders, Richard Williams and George Yannakakis. Williams was 79 last year when he won the M75 in 2:13:02. But Yannakakis ran a 2:06:15 at the USA Rock n Roll Half Marathon in Washington D.C. three months ago, so Yannakakis was favored. And yannakakis did not disappoint, taking the title by over ten minutes. This is the first year USATF included a team competition in the Half Marathon. Not many teams took up the challenge in the first year. 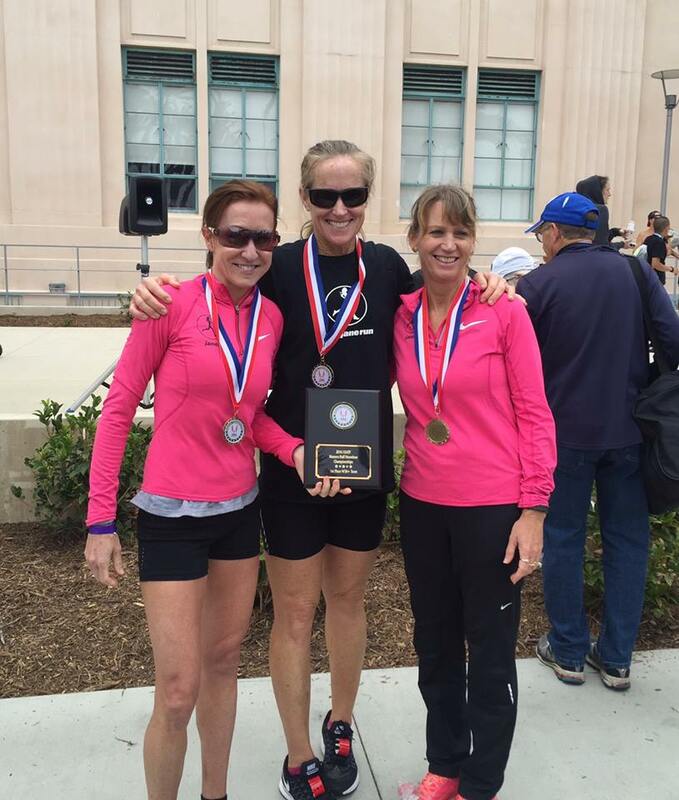 Two divisions had more than a single complete team entered, the W40+ and the M70+. The other divisions had only one complete team entered; when their third runner crossed the finish line they won the Gold Medal for the division. This was a close contest despite Cal Coast having the overall Bronze medalist in Ngo. Ngo crossed the finish line first but 5 minutes later Wasatch’s Stanford finished. At that point Cal Coast was ahead by about 5 minutes. The second runners in added to the lead as Cal Coast’s Lynch finished in 3rd, 1:42 ahead of Wasatch’s Simonaitis. That gave Cal Coast a cushion of nearly 7 minutes heading into the 3rd and last scorer; they needed almost all of it. Wasatch’s 3rd runner, Burnett, came in 4 and a half minutes after Simonaitis. Then it was a question of waiting to see how long it would take for Cal Coast’s 3rd runner to come across the finish line. After 5 minutes came and went, it looked like Wasatch might have caught Cal Coast but then Sweningson came in, only 5:34 behind. And that sealed the win for Cal Coast. M70+. There were three complete teams entered, the Ann Arbor Track Club [Paul Carlin, David Cohen, Malcolm Cohen, Phillip Kroll], the Shore AC [Przemyslaw Nowicki, J.L. Seymore, Edward Smith], and the Tamalpa Runners [Jerry Coletto, Bob Cowdrey, Hans Schmid]. Unfortunately, Coletto, of Tamalpa, was unable to make it so that left only Shore AC and Ann Arbor TC. Shore AC got the early lead as Nowicki came across the line in 1:41:19. The first runner for Ann Arbor, Cohen, finished 14 minutes back. When Shore’s 2nd and 3rd runners, Smith and Seymore, both finished ahead of Ann Arbor’s 2nd runner, Kroll, the race was over. Shore AC had taken Gold and Ann Arbor was delighted with their Silver Medal. Other team in contention: Cal Coast TC 47.